How Do I Set Up My 3dcart Store's Wish List? Use the search bar at the top of the page and search for "Wish List"
Enable Wish List: Place a mark in this checkbox and save the Store Modules page to enable the feature. 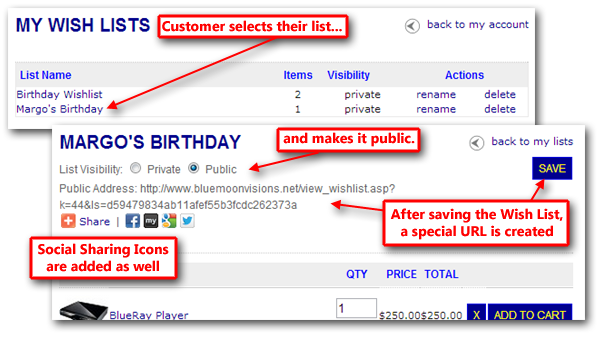 Allow Multiple Wish Lists: This will allow registered customers to create separate wish lists on their account. Allow Public Wish Lists: Marking this checkbox will allow customers to make their wish lists publicly viewable and able to be shared on social media channels like facebook. You can change the wording of the "add to Wish List" link in the Settings ->Design ->Store Language page. Clicking on the "Details" button will let you view a listing of the customer records that have placed the particular item on their respective Wish Lists. viewing any orders in which the customer may have already purchased the wished for item. Merchants can also create a Newsletter Smartlist specifically for the product. While viewing an item's submitted wish lists, you will see a button at the top right labeled "Create SmartList" that will let you begin this process. Wish List item is no longer available for purchase, but you have comparable or updated products that are newly stocked and ready for purchase. 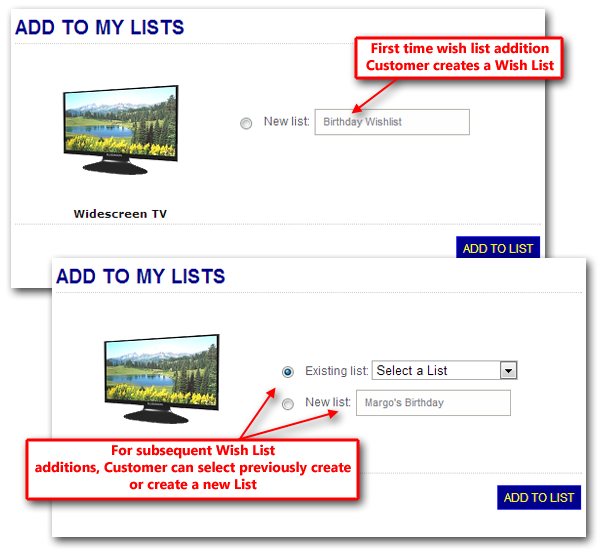 Create a smartlist informing these wish list customers of the new products. Merchants can also allow their customers to create multiple wish lists on their account. This can be useful to shoppers who want to create different wish lists for different occasions. To enable this option, you will need to mark the "Allow Multiple Wish List" checkbox on the Wish List Module.